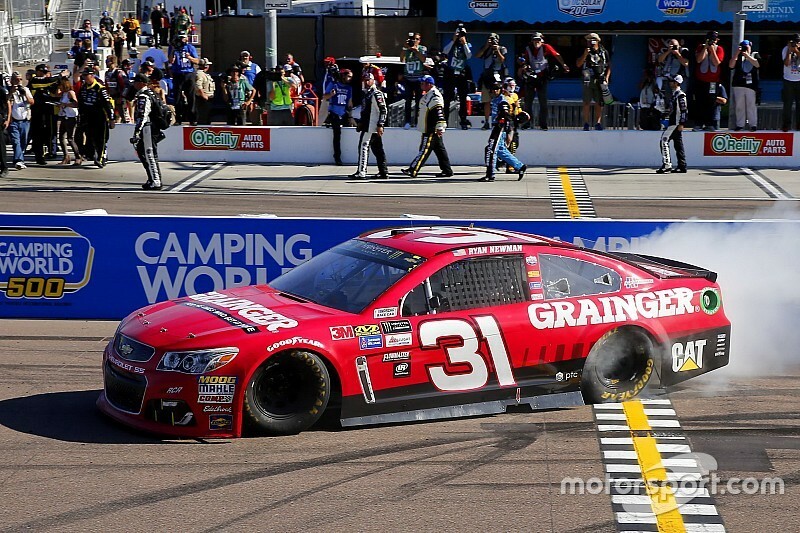 For all former NASCAR winners experiencing a drought, Ryan Newman proved there’s still hope. Newman’s victory at Phoenix Raceway on Sunday ended 127-race winless streak for the driver of the No. 31 Chevrolet. While four years may seem like a long time between wins, Newman’s dry spell was no where close to Derrike Cope’s. The last time Cope visited Victory Lane was at Dover in June of 1990, 912 races ago. But the 1990 Daytona 500 winner keeps plugging away. Who among the Monster Energy Cup Series walking winless might be the next to break through? Here’s how some of the triple-digit drought-enduring drivers stack up. It’s been 219 races since Bayne became the youngest winner of the Daytona 500 at 20 years, one day. Now, 26, Bayne has a full-time ride with Roush Fenway Racing. Under the direction of crew chief Matt Puccia, Bayne is enjoying the best season of his career. While it’s still early in the season, the driver of the No. 6 Ford has completed every lap raced, has an average qualifying effort of 17.5, average finish of 13.5 and is currently 12th in the standings. While Bayne’s best average finish on a track is 12th at Kentucky Speedway, most of his laps led and top 10s were earned on restrictor plate tracks. Bayne has just three starts at Auto Club Speedway — but has improved with every race. He finished a career-high 20th at the two-mile oval last year. Who could forget Menard’s first — and only — Cup win in the 2011 Brickyard 400? Given the Menard family’s contribution to racing, it was only fitting that Paul was able to kiss the Bricks at the motorsports mecca. Still, it’s been 200 races and nearly six years since the No. 27 reached Victory Lane. And Menard, 36, has worked with four different crew chiefs since winning with Slugger Labbe at Indianapolis Motor Speedway. Certainly, Newman’s win should be uplifting for everyone at RCR, including Menard, who was the first driver in the stable to score a top-five finish (Daytona) for the company this season. After 10 years on the Cup tour, Menard’s best results have come at Talladega Superspeedway and Michigan Speedway — a sister track to this weekend's Auto Club Speedway. Menard earned his first top five at Fontana in 2011. The long-suffering nightmare for Bowyer ended the moment he climbed behind the wheel of the No. 14 Stewart-Haas Racing Ford. Bowyer’s last trip to Victory Lane came with Michael Waltrip Racing at the 2012 fall event at Charlotte Motor Speedway, 153 races ago. Bowyer earned a career-best three wins that season. But with this caliber of equipment, Bowyer, 37, has no excuses when it comes to performance. While his communication with crew chief Mike Bugarewicz is still a work in progress, there’s no reason why Bowyer can’t maintain the same pace as Kevin Harvick and Kurt Busch. Bowyer has eight wins in 401 races. Six of the victories were repeat wins at three tracks — Richmond, Talladega and Loudon. In 2017, Bowyer has three top-15 finishes. His best result was 10th at Las Vegas. Bowyer enjoys his best average finish at Sonoma — 11.5 — where he won in 2012 and has eight top-10 finishes in 11 starts. His only DNF came last year when an electrical issue sidelined the No. 15 after five laps. In 16 starts at Fontana, Bowyer has two top fives, seven top 10s and has led 47 laps in 16 starts. Ragan understands what it’s like to struggle through a drought. His second-career Cup win at Talladega in 2013 came 65 races after his first victory in the 2011 July Daytona race. Like Bowyer, Ragan has bounced between teams but now finds himself back with Front Row Motorsports — where he earned his last win and the company’s first. In 10 full Cup seasons, Ragan, 31, has two-career wins, two poles, 15 top fives and 36 top 10s. The only tracks where Ragan’s average finish is better than 20th is at Talladega (19.5) and Fontana (19.9). Talladega is where Ragan has enjoyed his most success with four top fives and seven top 10s in 20 starts. His sole top-10 finish at Fontana came in 2009 when he finished seventh in the No. 6 Roush Racing Ford. McMurray’s winless streak of 116-races can’t compare to his longest drought. After McMurray scored his first win at Charlotte Motor Speedway in just his second Cup start, his next victory didn’t come until five years and 166-races later at the 2007 July Daytona race. McMurray has been streaky during his 15 years in Cup. Much of his inconsistency, however, stemmed from the instability of his teams — whether he was with Ganassi Racing or Roush Fenway Racing. When McMurray returned to Ganassi after three years with Roush, he posted a career-high three wins in 2010, collecting victories in two of NASCAR’s most prestigious races — the Daytona 500 and Brickyard 400 along with a second trophy from the Charlotte fall race. McMurray has earned just one win since — at the Talladega fall race in 2013. The bright side for McMurray is that Ganassi Racing is trending upward again. Teammate Kyle Larson leads the standings. McMurray is eighth. His average qualifying effort of 6.2 is second only to Brad Keselowski (4.8). McMurray has led 13 laps in 2017 — 13 more than he led last season. In 21 starts at Fontana, McMurray has two poles, three top fives and seven top 10s. His last top five came in 2005. Almirola’s one and only win came in the 2014 July Daytona race 94 races ago. In nine Fontana starts, Almirola’s best result was 11th in 2015. He’s led no laps at Auto Club Speedway, has finished on the lead lap in three races and has an average finish of 28.1 on the two-mile track. It’s been 90 races since Dinger’s sole win at Watkins Glen in 2014. He has two eighth-place finishes at Fontana in this last three starts, both with JTG-Daugherty Racing. The California native has seven lead-lap finishes at ACS and has led one lap. Kahne locked himself into the 2014 Playoffs with his win at Atlanta — one race before the cutoff. He’s mustered six fourth-place finishes and one third-place result (at Charlotte) in his last 87 starts. Kahne, 36, actually won at Fontana — in 2006. His last top-five finish at ACS came in 2010 while he was still with Richard Petty Motorsports. In 20 Fontana starts, Kahne also has posted one pole, four top fives and 10 top 10s.